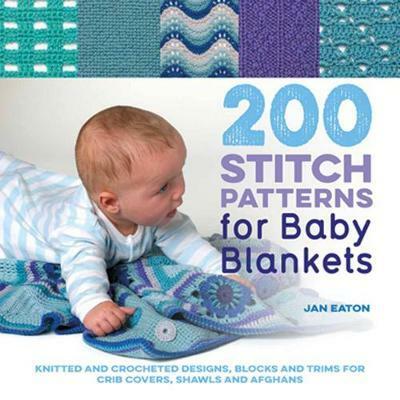 A new edition of the popular stitch book for designing baby blankets, by internationally renowned needlecraft and textile designer, Jan Eaton. Wrap up your baby in the ultimate comfort blanket: a blanket stitched by you. This is the biggest ever collection of knitting- and crochet-stitch patterns specially designed for making cosy crib covers, beautiful heirloom shawls and supersoft blankets and afghans for your little one, or to give as thoughtful presents for your friends and family. 200 stitch patterns are featured inside, offering mix-and-match block designs and a selection of pretty trims, each accompanied by a detailed swatch photograph and easy-to-follow instructions. Experiment with colour and texture and choose from bobbles, cables, lacy picot patterns, ripples, and blocks featuring hearts, teddies and flowers. Designs are rated according to degree of skill required, and all stitches and techniques are clearly explained - making this book perfect for absolute beginners and experienced knitters and crocheters alike. This book opens with an introduction from Jan. Like many of us, Jan likes to make baby gifts to welcome new arrivals into the world. The How To Read This Book section includes helpful information for navigating this book, which includes more than stitch patterns. The Using the Block and Stitch Directory section explains the symbols used in each pattern. The book has its own levels of difficulty (1 is easy, 2 is some experience required, and 3 is challenging). The difficulty levels are indicated before each pattern with the number of hooks or needles. For example, a challenging knitting pattern will have 3 needles before the pattern. Jan uses symbols to explain how each pattern is worked, such as in horizontal rows, in the round, in diagonal rows, "L-shaped" rows (mitered squares), and filet crochet. (Border/edging patterns indicate if they are worked lengthways or widthways, too.) There is also a glossary of pattern terminology in this section. The patterns are written in abbreviations, with US terms first/and UK terms in italics for the crochet patterns. 200 Stitch Patterns for Baby Blankets: Knitted and Crocheted Designs, Blocks and Trims for Crib Covers, Shawls and Afghans is a wonderful book that is sure to delight any crocheter or knitter who likes to make blankets or other baby gifts, or who just likes to experiment with new stitches. As the book is a thicker paperback, it doesn't lay flat when it's open, so you'll need to use a bookmark to keep your place while you're crocheting or knitting. It doesn't include international stitch symbol patterns, which some crocheters and knitters prefer. (The filet crochet patterns are both written and charted, however.) These are minor "flaws" in an otherwise amazing collection of inspiration. Because the book includes more than just the stitch patterns, it's also a great reference guide for your crochet or knitting collection. Jan Eaton is known internationally for her speciality in needlecraft and textile designs. Since finishing her training at Goldsmiths College in London, Jan has worked as a freelance designer showcasing her embroidery, crochet, knitting, and textile painting designs in various UK and European magazines. Jan has written more than 10 needlecraft books and lives in Hove, East Sussex.